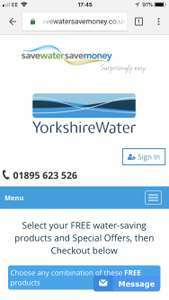 Free water saving pack - Yorkshire water customers only!!! We’re offering every Yorkshire Water customer the chance to cut their utility bills. Our handy free water saving kit can help you save water, energy and money! I think you need to amend the title to Yorkshire Water customer only ! Anyone used 50,000 litres since May like my water company think I have?? They claim they have checked and there have been no leaks. The companies loose billions of litres, now they make us think that WE are the problem by saving the odd bucket full ? They get all the water back anyway... it's all a scam. 4 minutes for a shower!? I spend more than that just stood there enjoying the feeling of the water.